Snap frames are a great little invention. If your walls are a bit of a nightmare to drill into and you worry that your existing frame is rather heavy and cumbersome, a snap frame may be the solution you are looking for. 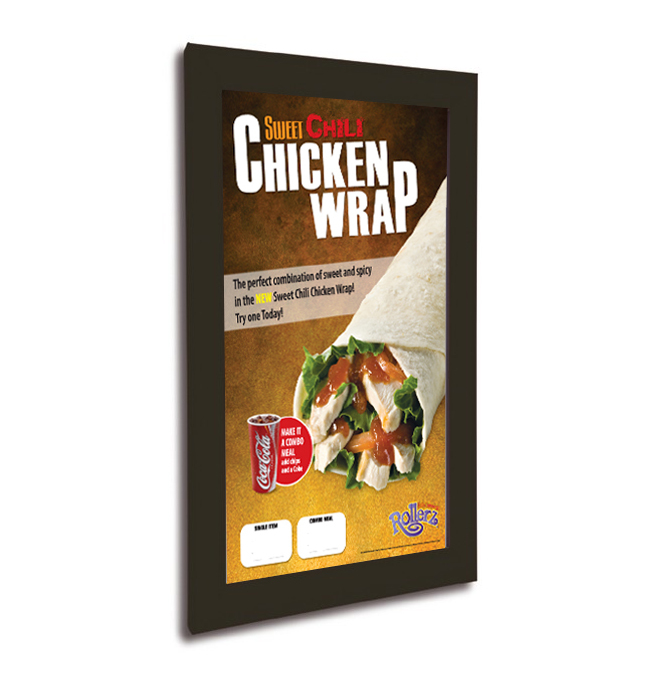 Snap frames are ideal for offices, corridors, pubs and restaurants - anywhere where you need to display posters and notices to employees or the general public. Our stylish range of aluminium snap frames offer excellent value and a practical solution for framing posters, notices, advertising messages and movie posters. Snap frames provide a quick and easy display as all four sides of the frame can open and close in seconds, allowing you to make easy work of what used to be a very fiddly job. Made of extruded aluminium, you won’t have to worry about the thought that the frame is going to come crashing down due to its weight. Snap frames are designed for displaying those all important advertising campaigns. With the ability to be used both in a landscape orientation and a portrait orientation, the snap frame is suitable for all messages and notices. Snap frames come in 25mm and 32mm sizes and have an anti-glare poster cover to stop any distortion of your display. The anti-glare design will also help prevent your image from fading in bright light or sunshine. Snap frames can be used for internal or external display purposes. Snap frames load from the front allowing for quick changes of your posters. All four of the frame sides have a spring-loaded hinge which 'snaps' shut under tension. You just need to simply pull up each side, place your poster inside the frame, cover your poster with the included plastic protective sheet and 'snap' each side back. You are able to choose from standard brushed aluminium finish, polished silver aluminium finish, coloured frame or a Black Snap Frame finish. All have sturdy frame hinges for easy poster loading and an optically transparent plastic protective sheet. Along with our standard snap frames we have a range of sizes available in our lockable snap frames which are tamperproof for additional security. 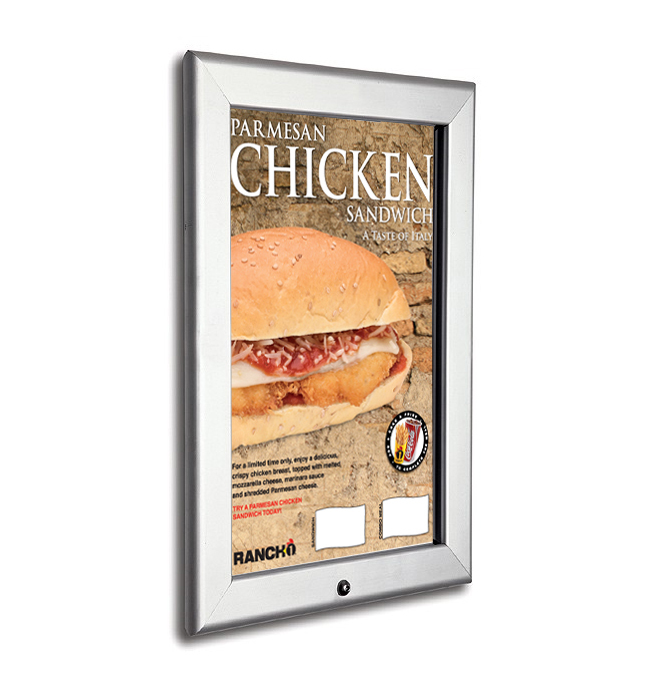 This poster frame has a sequential locking system which quickly secures what is displayed inside. It can be locked with an Allen key to ensuring your all important notices aren’t tampered with. Our coloured frame snap frames are available in 9 sizes, whilst the rest of our range is available in 6 sizes, ensuring there is frame suitable for you no matter what. Sizes A4, A3, A2 and A1 are held in stock and dispatched within 24hrs for next day UK delivery. Ensuring those last minute messages or adverts can be delivered in time. Once you have received your snap frame, there is a wall fixing kit included, enabling your message to be up and running in no time. For more information on our snap frames, please contact us or call our sales team on 01733 511030.